Following on from the success of our first quiz night in January, we are pleased to announce the return of this event. 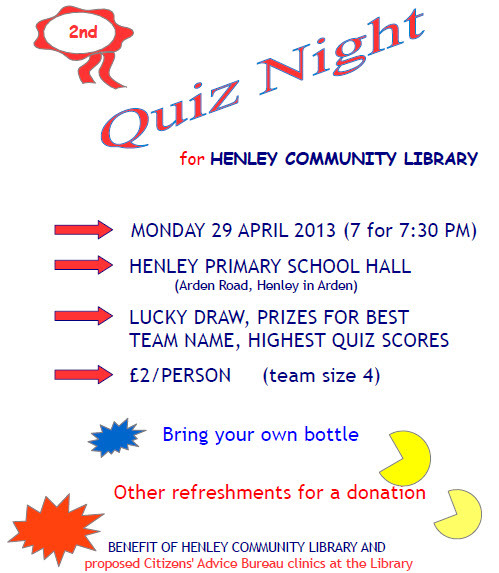 The second Henley Community Library Quiz Night fundraiser will be held on MONDAY 29 APRIL 2013. Doors open at 7 p.m. and the Quiz will kick off at 7:30 p.m. As in January, the venue will be HENLEY PRIMARY SCHOOL HALL, Arden Road, Henley in Arden. In addition to the quiz there will be a LUCKY DRAW, PRIZES FOR BEST TEAM NAME and HIGHEST QUIZ SCORES. The entry cost is £2 per person with a team size of 4. Please bring your own bottle, other refreshments will be available for a donation. The event is for the benefit of Henley Community Library and the proposed Citizens’ Advice Bureau clinics at the Library. This latest project is a proposal to hold fortnightly Citizens’ Advice Bureau clinics for the benefit of local residents in the Library. We have been notified that we will receive a grant to fund an outreach worker for a year, and now await a decision by the CAB on whether the clinic will go forward. One of CAB’s biggest concerns in setting up an outreach clinic is evidence that it can be sustained. Community support in the form of a vigorous response to grassroots fundraising can only help. You can regeister and pay your Quiz Night fees at the Henley Community Library desk or you can download a pdf registration form from this website at Quiz Night Registration Form, simply print, fill it out, and post to Henley Community Library, Hollyhocks, Mayswood Rd, Wootton Wawen, H-in-A, B956AX or return it to the Library. Enquiries: 01564 792 941. If you’re late, or don’t have 4 people, come and register at the door!